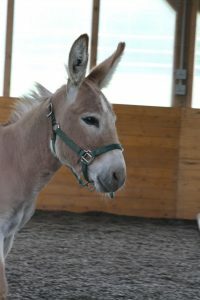 Roscoe is a beautiful, 4 year old, rose dun donkey. He was purchased from the New Holland Auction on May 9, 2016. It was clear from his over grown hooves and shy personality that he had had little to no handling in his short life. Despite being alone in a strange place he was willing to trust and approached for ear scratches. Now that he is back at the farm, we have started the process of gaining his trust and teaching him basic ground manners. With time and patience this sweet little guy will blossom into a willing companion. UPDATE: It is with great pleasure that we announce that Roscoe has found a forever home. Many people expressed empathy for Roscoe when Squeak was adopted, since the two were practically inseparable. However, we knew there was an adoption in the works for our Mini Donkey friend. Roscoe came to Horses with Hope along with Squeak from the New Holland Auction. Once Roscoe settled in he became curious and much more social. Although trimming his feet was a challenge, Roscoe never held it against us and understood that we were there to help. Enter the Nason’s. This caring family fell in love with Roscoe from our very first post. They came to visit him several times, and have made many accommodations for Roscoe anticipating the day that they could take him home. That day finally happened at the end of last week. Although Roscoe starts the next journey in his life without Squeak, he now has a new friend in his life named Clyde, who is also a rescued Donkey. We wish the Nason’s many enjoyable moments Roscoe (and Clyde) and we are very appreciative for giving both of them such a loving home.